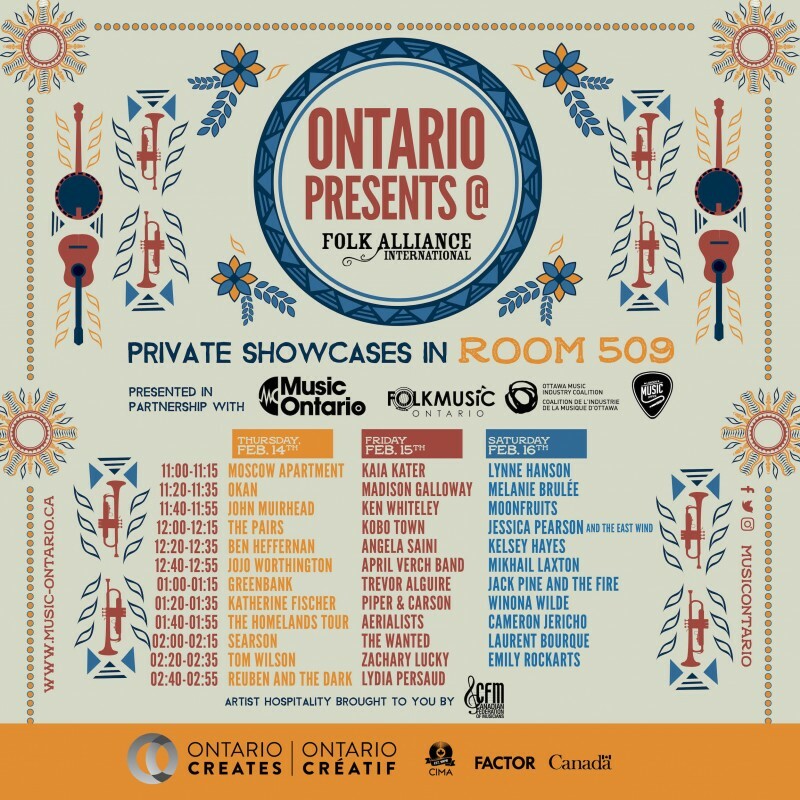 Lineup Announced for MusicOntario's Private Showcase Room at Folk Alliance 2019! Winners of a 2017 Canadian Folk Music Award, a Toronto Independent Music Award, a Canadian Songwriting Competition award and Slaight Music’s It’s Your Shot Competition, Moscow Apartment (Brighid Fry & Pascale Padilla) is a young (15 & 16 years) duo driven by a mixture of sweet harmonies, belted refrains, and clever wordplay. Their songs easily slip and shift through a variety of genres to create a distinct indie folk rock. When they sing together it is like honey to the ears. Friends for years, having first met as members of the VIVA! Youth Singers, Brighid and Pascale began Moscow Apartment early in 2017. It has been a whirlwind ever since with the two talented teenage songwriters gaining accolades across Canada. They get played on CBC and NPR and have toured across Canada opening for The Good Lovelies and have a growing list of fans from Kevin Drew to Ron Hawkins. OKAN: Women-led Afro Cuban Roots and Jazz Taking its name from the word for heart or soul in the Afro-Cuban religion, Santeria, OKAN derives inspiration from the roots of Cuban music and contributes to the contemporary evolution of these powerful traditions by blending jazz, Afro-Cuban and classical forms with world rhythms. Embracing genres and musical roles that have historically been dominated by men, co-leaders, composers and multi-instrumentalists Elizabeth Rodriguez and Magdelys Savigne bring a fresh perspective to Cuban music through powerful vocals, incredible musicianship and potent lyrical content. With stories and songs that kindle late-night Canadian campfires, John Muirhead’s heartfelt indie-folk sound will move you in more ways than one. From fingerpicked folk confessionals to upbeat roots-rock jams, John’s eclectic song collection reflects the highs and lows of love, ambition, and being a young musician. While he is based in London, ON, John is a a troubadour by nature and has played in living rooms, theatres, moving trains, and folk festival stages across Canada. With influences including Frank Turner, Neil Young, The Weakerthans, and Julien Baker, John’s primary goal is to change the lives of listeners the way music has changed his. In the two years since the release of his debut EP Yesterday’s Smile, John has been nominated for a Canadian Folk Music Award, given an honourable mention in the Canadian Songwriting Competition. "Their stage show is packed with exceptional three-part harmonies, with all the beauty and intensity of a pipe organ. At any point in the show the vibe can transform from Joni Mitchell to full out Destiny’s Child.” - Gerard Creces The Pairs are a female fronted folk pop quartet with deep roots in London, ON. Powered by 3 classically trained vocalists and a former punk rock drummer, their unique blend of harmony and rhythm will hug your eardrums and FORCE you to dance. Their storytelling and honest songwriting provides an uplifting audience experience you won't want to miss. With 3 unique songwriters at the helm, The Pairs are able to create a diverse repertoire using their individual lives as inspiration for their writing. Employing music as a tool for sharing stories of life's challenges, personal growth, hope and hilarity, The Pairs inherently connect with the audience/ community through their emotion full performances. Ben Heffernan is an 18-year-old singer-songwriter from London, Ontario. 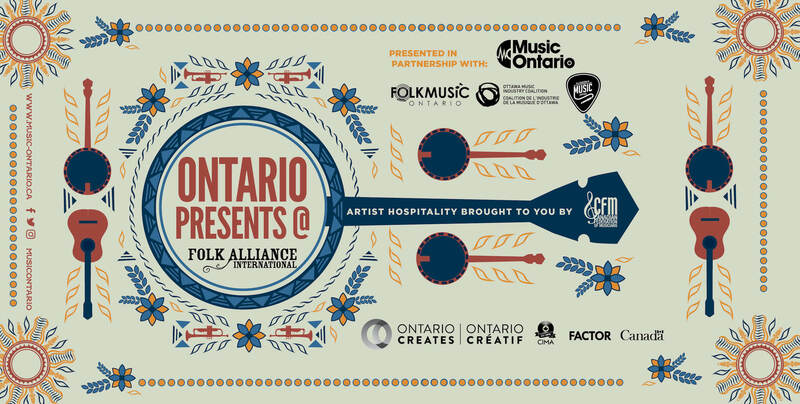 After winning the Taylor Mitchell Bursary at Folk Music Ontario around the release of his first EP, Different Wars, Heffernan followed it up in 2018 with the release of another 3-song collection, “Home”, his first Ontario tour, and appearances at various Canadian folk festivals including Winnipeg Folk Festival. His cover of Tom Petty’s Angel Dream was included on the Canada Covers Tom Petty compilation, alongside artists such as Terra Lightfoot, Matt Mays, and Royal Wood. Angel Dream received airplay on CBC, Sirius XM, and acclaim from Spill Magazine, who called the cover “incredible”. The future appears to be bright for this young artist, who is determined to continue to build his name and to establish himself as an exciting emerging singer-songwriter in Canada. Kitchener-Waterloo artist, JoJo Worthington, has won numerous awards + accolades, yet hasn’t stopped pushing her work to uncomfortable boundaries. Worthington’s latest work 'Two Lines’ is a surge into new territory. Her vocalizations reminisce of Kate Bush, her ingenuity with looping techniques remind one of the omnipresent Canadian force of Owen Pallet, and her completely refreshing take on the [often blasé] ukulele is pushing the experimental-folk musician to create some of the most forward-thinking music of her generation. JoJo Worthington has had the honour of performing with many talented artists + bands including: Frightened Rabbit, Novo Amor, The Great Lake Swimmers, Ben Grossman, Craig Cardiff, Ariana Gillis, The Grapes of Wrath, Jacob Moon and more. Worthington’s most recent exploration has been with The Lifers as co-producer on their latest album “Honey Suite”. "Honey Suite" was recently nominated at the 2018 Canadian Folk Music Awards. Worthington is continuing her pursuit in production and is now working with hip-hop artist Sam Nabi. The Homelands Tour follows the night sky, journeying along plains, down rivers, across oceans to bring established and young First Nations artists from Australia and Turtle Island (Canada) together on their Homelands and out onto festival stages around the world. Featuring songwriters-in-the-round and a genre-fused and campfire-fuelled finale. Feat: Glenn Skuthorpe (AUS), Michel Bruyere (BC), Pirritu Brett Lee (AUS), Justice-Lee Quachegan (ON). Searson Giving Canada’s old time sounds a renewal into modern roots; seamlessly blending spirited fiddling, energetic dancing and gorgeous harmonies. For over a decade now, Searson has toured the world with their unique blend of high energy fiddling, passionate vocals and intricate step dancing. At the core of Searson, are Colleen & Erin Searson, two sisters who hail from the Ottawa Valley, Ontario, Canada. Their spirited live shows feature Colleen on fiddle and Erin on piano & tenor guitar. Interspersed with the incomparably rich sounds of sibling vocal harmonies, both sisters “pound the boards" with Ottawa Valley step dancing. This November 2018 Searson recorded their 10th Album - a live CD, along with a full length performance DVD! Searson will be touring in support of this Spring release in 2019! Their previous recent release, Homegrown (2017) is their ninth studio recording and features songs by Canadian artists and songwriters who have influenced them in positive ways. Reuben and the Dark's sophomore album, Arms of a Dream, is a monumental artistic statement from the spirited folk outfit led by Canadian songwriter and vocalist Reuben Bullock. Over eleven songs, Reuben maps the rugged terrain of dreams, exploring the inversion of imagination & reality in his most vivid music to date. Reuben and the Dark shines a light on the fine detail of this darkness, with powerful imagery and lush sonic detail at the forefront. Whereas the debut album Funeral Sky lavished in low fidelity, the new album is a high-definition dream. Produced by Stephen "Koz" Kozmeniuk, Adrianne "AG" Gonzalez, Graham Lessard, with mixing by Matty Green, Arms of a Dream distills the best of three years of songwriting exploration. The album is a magnification of the reckoning at odds in most souls - be it Reuben's or our own - revealing the balance of extremes at play in every life scene. A Montreal-born Grenadian-Canadian, Kaia’s old-time banjo skills, jazz-fueled voice and deft song craft have garnered acclaim from NPR, CBC, Rolling Stone, BBC Music, and No Depression. Her 2016 release Nine Pin won a Canadian Folk Music Award and sent her on an 18-month touring journey from Ireland to Iowa. Kaia release her third album, 'Grenades', in October 2018. Madison Galloway is an emerging voice in Canadian folk music. The multi-instrumentalist songstress is making a name for herself as a must-see act, consistently turning heads with her charismatic, authentic, and high-energy performance! Madison blends influences from folk, rock, and blues, reaching back to pay homage to the great artists of the past while creating an original sound. Joined by Jonathan Markov on slide guitar, she takes the stage with her soulful voice, guitar, and harmonica delivering music that’s gritty with earthy tones, but also delicate and has a sunny personality all its own. Madison has toured relentlessly as a band, duo, and solo act in support of her debut EP, performing at local concert halls and prominent festivals including Mariposa Folk Festival, Riverfest Elora, and RBC Bluesfest, while opening for acts such as 54-40, Ron Hawkins, and Alysha Brilla. Watch out for Madison’s highly anticipated new album in 2019! Ken Whiteley has won a Canadian Folk Music Award, a Genie Award for Best Original Song in a Canadian film, Lifetime Achievement Awards from Folk Music Ontario and the Mariposa Folk Festival and has been nominated for 7 JUNO Awards and 17 Maple Blues Awards. Called a “roots music master”, he’s performed at major folk and blues festivals throughout North America including being the first Canadian act invited to play at the famous Chicago Blues Festival. Ken has performed and recorded with such legends as Pete Seeger, John Hammond Jr., Tom Paxton, Stan Rogers, Guy Davis, Basia Bulat, Raffi and countless others. A prolific songwriter, a gifted and versatile instrumentalist and a powerful singer, as one critic has said, “with Ken Whiteley our enjoyment is virtually assured.” He says, “I sing, write songs and share my knowledge of traditions because the whole point is to bring people together." Founded and fronted by émigré Trinidadian songwriter Drew Gonsalves, Kobo Town’s music has been variously described as “an intoxicating blend of lilting calypsonian wit, dancehall reggae and trombone-heavy brass” (Guardian) and a “unique, transnational composite of rhythm, poetry and activist journalism.”(Exclaim!) From their home in Toronto, the JUNO Award-winning group has brought their distinct calypso-inspired sound to audiences across the world, from Port-of-Spain to Paris and from Montreal to Malaysia. At once brooding and joyous, intensely poetic and highly danceable, Gonsalves' songs betray deep roots in Caribbean folk music, while the band delivers them with an indomitable energy that has earned them a considerable following far beyond the niche of world music enthusiasts and calypso fans. Toronto-based folk pop artist Angela Saini is all about second chances and empowering others. Her ability to combine humanistic and honest themes laden with catchy hooks and memorable melodies make her entertaining as well as relatable. With two European and five Canadian treks under her belt, Angela is a 2017 Toronto Independent Music Award Winner and blogTO named her in their “Top 5 Folk Acts to Watch.” Her upcoming album “Hope on the Stereo,” due early 2019, is complete with themes of hope, despair, confusion, joy, love, and how they all happen in the same place. Is it in your heart, or your head? Lead single “Black Sheep” showcases her genuinely positive outlook and reflects her life-affirming perspective: the road may be untraveled, but you’ll never know if you don’t take a chance. April Verch steps, sings, and fiddles with a fresh approach to deep North American traditions. Touring the world with her trio featuring Cody Walters (bass, banjo) and Alex Rubin (guitar), Verch keeps the community-fired celebratory side of her traditional music at the forefront, honing a keen awareness of how to engage contemporary listeners. At the heart lie Verch’s delicate voice, energetic footwork, and stunning playing, a trifecta of talents she brings together simultaneously to jaw-dropping effect. Even as she plays with the tradition she inherited in her native Ottawa Valley, Verch’s energetic and breathtaking performances speak to the heart of roots music with mature and reflective songwriting, interpreting, and storytelling. From festival stages to intimate house concerts, Piper and Carson remind us of why we go to see live music. Their songwriting is free and fiercely personal; as if it’s been running in the woods, washing in cold water, and howling with wolves. The couples undeniable chemistry and onstage presence draws the audience into the conversation. Piper’s immersive storytelling provides context and familiarity bringing their original music to life. After first meeting on Carson’s father’s organic vegetable farm, they’ve spent the last four years touring Canada coast-to-coast, showcasing at international Folk Conferences, touring overseas in the Netherlands and to the Edinburgh Fringe Festival. In December 2017 they released their first album, ‘Piper & Carson’. Their work is deeply rooted in intention and both strive to use their platform to forward social change and promote mental health awareness. This duo will make you believe that folk music can change the world. Transatlantic quintet Aerialists meld their ferociously creative harmonic sensibilities and deep love for folk traditions into a post-rock coloured sound called prog-trad. A collaboration between guitarist Adam Iredale- Gray (Fish & Bird), lever harpist Màiri Chaimbeul (Darol Anger & The Furies), and fiddler Elise Boeur (Jenny Ritter) with a stellar rhythm section, the group met when they were attending Berklee College of Music in Boston, MA. They draw from the wells of Nordic and Gaelic music, adding expansive textures and meticulously sculpted arrangements to create captivating, genre-defying new music. The new album Group Manoeuvre is a powerful collection of neo-folk compositions and stellar musicianship, nominated for a 2018 Canadian Folk Music Award for best Emerging Artist. Zachary Lucky is unapologetically old-school country, armed with a husky, baritone voice - He sings of Canadian places and people as knowingly as he might Townes Van Zandt or the Rio Grande. It's a relatable show on many levels and conjures universal feelings that have passed through our collective timelines. Already hailed as a master storyteller by outlets ranging from No Depression to The Globe and Mail, and recently nominated best solo artist of the year at the 2017 Canadian Folk Music Awards, Lucky’s Everywhere A Man Can Be is his most powerful statement to date. Lydia Persaud is a Toronto born & raised soul artist. An alumna of the Humber jazz program and member of the O'Pears & Dwayne Gretzky, she is a skilled vocalist and songwriter. Lydia draws on her jazz chops, the sincere songwriting of Carol King, and the warm soul and social commentary of Stevie Wonder to craft her timeless and instantly infectious sound. She is newly signed to Outside Music for her first full-length album. Lydia has been gaining accolades in the Toronto music community. The 2013 Oscar Peterson Award winner, she has been praised for her intimate songwriting and stunning vocal, while 'Low Light', the single from her debut EP, reached top 10 on CBC Music. After being selected by Jim Cuddy for his NXNE showcase this spring, Lydia has been charming audiences around Ontario with her stunning voice and solid grooves on a summer tour. LYNNE HANSON and The Good Intentions (CANADA) are known for their hard-living style of music, mixing gritty ballads with driving roots-tinged guitar. Lynne Hanson's deep bluesy croon is pure and full of fortitude, and she's drawn comparisons to Lucinda Williams, with a touch of Gillian Welch thrown in. Lynne Hanson has toured the US, Europe and the UK, either solo or with her band The Good Intentions. She’s showcased in Austin, TX and Memphis, TN, toured in support of Grammy nominated artist Gretchen Peters and Steve Forbert, and opened for Grammy-award winning guitar legend Albert Lee. She received a Canadian Folk Music Award nomination in 2009 and won the prestigious Colleen Peterson Songwriting Award in 2010. She is currently working on her new album, due for release in the Fall of 2019. Partners on and off stage, Moonfruits summon music from a place where ideals and imagination intertwine. Recalling Harmonium’s soaring harmonies and Fred Pellerin’s easy storytelling, the bilingual Ottawa-based duo blends voice, guitar, banjo, kalimba and glockenspiel to transport audiences to imaginary village Ste-Quequepart (Saint-Somewhere), inviting them to walk in another’s shoes. Jessica Pearson is a Canadian born storyteller with a voice like melting honey on a summers eve. Accompanied by the melodic bowing of Pat Bigelow on the Stand Up Bass and the sweet fiddling of Maddy O’Regan, they bring to life tales of the past and express the beauty and heartbreak of the world today. Fresh off their second international tour of Ireland and third tour of Eastern Canada, Jessica Pearson and the East Wind are working hard on a new album to be released in 2019. Their debut EP 'Grave and Garden Songs', released in 2017, perfectly blends traditional folk, roots and East Coast bluegrass. From a cappella tunes sung in the middle of the audience to recollections of growing up in Canada, Jessica Pearson and the East Wind will take you on a journey with their dynamic live shows and entertaining story telling. The winner of the “Live Performance” category of the 2018 Canadian Songwriting Competition, Kelsey Hayes is an Ottawa based pop, singer-songwriter who takes the listener on a journey of love, longing, and betrayal. She released her debut EP to a sold-out crowd at Ottawa’s Mercury Lounge in Fall 2015, going on to win the Musik Ottawa Competition. In 2016, Kelsey made her international debut, touring multiple cities in China between playing shows at Ottawa's Bluesfest and Cityfolk Festival. Her most recent project was released on February 8th 2018 as part of the Ottawa Winter Jazzfest line-up. Mikhail Laxton is an Indigenous Australian performer who now resides in Ottawa, Ontario. He will be releasing his debut EP (Produced by Maia Davies) in early 2019 world-wide on acronym Records. Jack Pine and The Fire are an Ottawa based Alt-Folk band. Nominated for a 2018 CFMA Emerging Artist Award, Jack Pine writes eclectic folk songs with a style of their own. The Fire then sets them ablaze, beating their string-band image in to the ground. Acoustic mandolin, dobro, upright bass and drums, JPATF is 4 heavy right hands and a Lone Wolf... howling out a tune. On her third album Wasted Time the much-travelled Canadian singer/songwriter continues to redefine the image of the troubadour documenting her life and observing the world with both biting wit and heartbreaking honesty. It’s an approach that echoes some of country music’s greatest composers such as Townes Van Zandt and Billy Joe Shaver so it’s no surprise that she was named a winner of the 2017 Kerrville (Texas) Folk Festival’s New Folk competition and nominated for a 2018 Canadian Folk Music Award for best songwriter. One of the greatest feelings is to be lost in a moment of music. This can happen in the line at Starbucks, when listening to the radio on the way to work, or lying sleeplessly in bed. Cameron Jericho looks to create these experiences for you with his vivid imagery, honest storytelling, and careful melodies. Jericho pulls from both current and iconic influences to create an exclusive new sound that can only fall under the umbrella of Americana. Flirting with the best pieces of Folk, Country, Pop, and Singer-songwriter music, a depth of emotions are covered across his debut single “Anchor” and debut EP “Starlight”. laurent bourque is a songwriter, artist and performer in Toronto, Canada. In 2015 he released his debut album, Pieces of Your Past. Produced by Dave Draves (Kathleen Edwards, Julie Doiron), the album was recorded live in a single day. The live recording setting allowed for more feeling, and character to shine through Laurent’s accomplished songwriting. Songs from the album have been regularly featured on CBC radio, college radio as well as various television programs on MTV and the E! Network. Since its release Laurent has frequently toured Canada, The United States and Europe, sharing the stage with great artists such as Teddy Geiger, Dan Mangan and Andrew Bird. He was also awarded the “Stingray Rising Star” award after its release. Laurent is currently in the studio working on his new album with producer Dan Ledwell (Jenn Grant, Fortunate Ones) which will be released in 2019. Emily Rockarts is starting to catch on in Canada’s bustling music scene. Her songs explore the wide-eyed optimism of moving to new cities, the expansive depth of oceans, and the stratospheres of space. "Mapmaker", Emily Rockarts' debut release from April of 2016, is a collection of songs that is as sweet and light-hearted as it is thoughtful and full of longing. After a successful national tour in promotion of "Mapmaker", Emily is writing her first full-length album anticipated for release in 2019.